The “Prices and Promotions” add-on becomes “Prices and Credits“! This change comes with a major and highly requested feature. You can now put a price in credits on your events, and use booking passes to buy them. You can configure these passes for different kind of uses, and sell them in your WooCommerce shop. Your possibilities are multiplied, but the add-on price is the same. 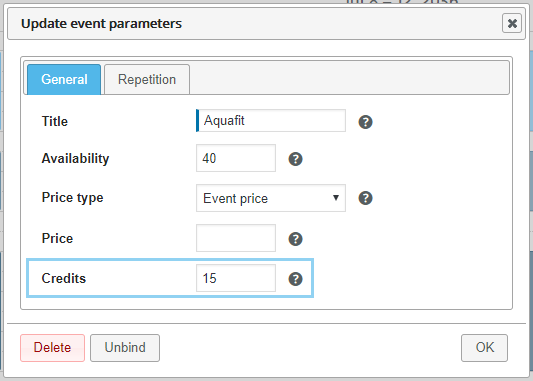 In your events settings, you will find the “Credits” field next to the “Price type” and “Price” fields. It allows you to give a credits value to the event. You will also find this field in the activities settings, so it will be applied to all the activity events. Similarly, each group of events, and each group category can have its own credits value. If no value is set, you won’t be able to pay the event with credits. Your events have a credits value, great. Now, let’s give / sell your customers a card with a certain amount of credits: the “booking passes”, so they can use them to book those events. You can create different kind of passes. Each has its own credits amount and its own validity period. They can also be restricted to certain activities, of certain calendars, certain groups of events, or even certain booking forms. In other words, you can give your passes very specific types of use. With WooCommerce, it is possible to sell your passes like any other products. Once the order has been paid, the pass is automatically created and delivered to the buyer. It is also possible to sell credit refills rather than a new pass. Sell your booking passes (or refills) with WooCommerce. You can display your customers’ pass list with the shortcode [bookingactivities_passes]. For your part, you can edit your customers’ passes as you wish: available credits, total credits, owner, associated pass template, expiry date. Manually create and manage your customers’ booking passes. 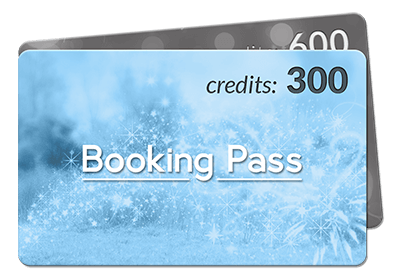 If you want your customers to be able to redeem booking passes on a form, you need to give them the opportunity. 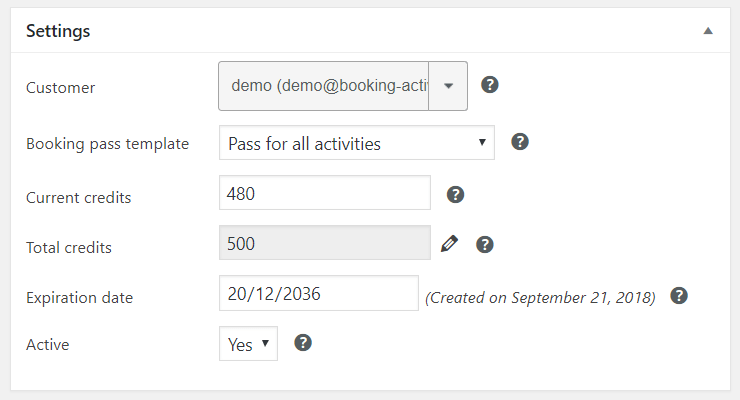 You simply need to add the “Booking pass” field to the desired form. Add a field to your forms to allow your customers to redeem certain types of passes. 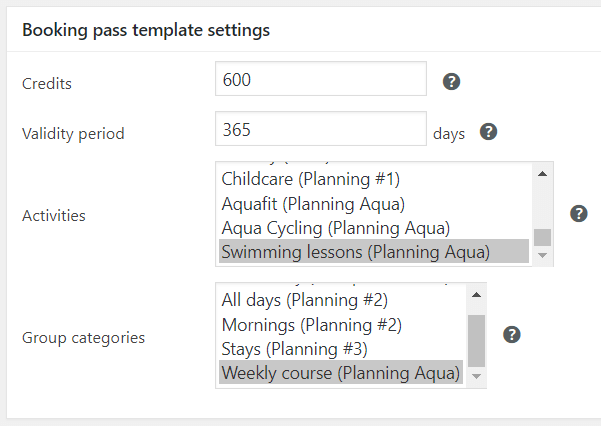 You can configure this field so it allows only specific pass templates, or even make it compulsory. Your customers will only need to pick one of their passes in the selectbox, it has to be compatible with the selected event. With Woocommerce, the pass is debited when it is added to cart, and the price in cash is nullified. After booking, the event credits price will be displayed in their booking list. On the admin panel, you will find this price in credits and the redeemed pass in your booking list, in a new column provided for this purpose. Of course, the Order for Customers add-on users will be able to redeem their customers’ booking passes to complete their bookings. The passes will be filtered according to the selected user. You will never be able to redeem someone else’s booking pass by accident, even when you make a WooCommerce order. You will be only be able to reschedule a booking made with a booking pass to an event worth the same price in credits, just like events booked with a special price / discount. 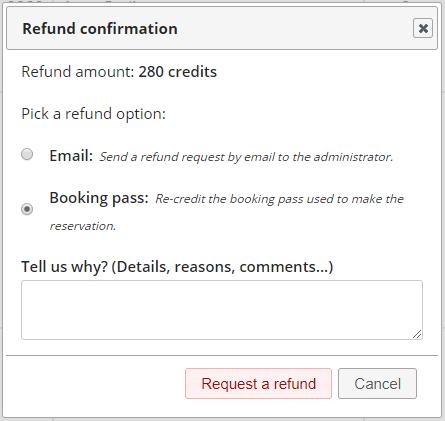 About refunds, a new refund method is featured for bookings paid with credits. It allows you to re-credit the booking pass with the amount of credits paid. You can benefit from this credits system in many ways. Set up the most appropriated one(s) according to your needs. If you don’t want to sell your events one at a time, you can sell only booking passes as coupons for n events, valid for specific activities. Then, provide booking forms with the “booking pass” field required. Even if you don’t use WooCommerce, your customers will be able to pay their bookings thanks to this virtual currency. You can perfectly sell your passes on your workplace, and create them on the go after you get paid. Or, with WooCommerce, if you force your customers to use booking passes on every forms, it equates to replace the real currency by credits. Your customers will have to buy a pass first, or reload it, in order to pay their bookings. A customer can buy a pass with the aim of giving it to someone else. You will simply need to change its owner on the pass edit page, in your admin panel.